Paid online surveys are becoming a rage worldwide. Canada is no different. One of the peculiar features about Canada is, the country has a large migrant population. Meaning, people of various nationalities from Asia, Europe, Oceania, Africa and South America have made Canada their home. Canada is no different when it comes to living expenses. Increasing number of people nowadays find it necessary to have a secondary source of legitimate income. Paid online surveys in Canada provides them these avenues. Swagbucks ranks among the biggest online surveys companies in the world. Though it is based in California, US, it has branch offices in Canada too. You can get $5 as signup bonus immediately after joining Swagbucks. SwagBucks is very popular Online survey in Canada as it is helping several people earn few hundreds dollars by completing simple & fun surveys. VIP Voice Canada (formerly NPD Online Surveys) is an American company with business footprints in Canada, VIP Voice conducts over 12 million Online surveys annually, at various locations. Further, this company also pays handsomely to its members who complete and submit surveys. “The world’s leading companies rely on us to help them develop and offer the right products and get them in the right places at the right prices for the right people in order to grow their businesses,” says VIP Voice. Joining is simple- by filling and submitting an online for with basic personal details. Founded in 2000, InboxDollars is an Inc 5000 company that pays real cash to millions of members and offers proven results to our advertising partners. In 2005, InboxDollars acquired SendEarnings, became an international corporation with the launch of InboxPounds in 2012 and expanded into Canada with DailyRewards in 2014. It is a division of US-based DailyRewards. With presence in more than 100 countries, Nielsen collects sales information from more than 900,000 stores in its worldwide retail network—including grocery, drug, convenience, discount and e-commerce retailers—who, through cooperation arrangements, share their sales data with the company, says Nielsen’s corporate website. Further, Nielsen Homescan also conducts surveys through customers and consumers. Nielsen is one of the biggest online survey site in the world and offers a variety of topics to members. This online survey and rewards website is owned by American group, Prodege. You can earn a lot of money by simply completing their online surveys. Further, you can add even more points by shopping at MyPoints. All these add up to a fairly huge amount. MyPoints is unique since you can also download coupons to shop. Using MyPoints enables you to also save on your routine expenses. Another top American company, SurveyJunkie offers excellent surveys in Canada too. You can enroll to join the company’s research community in Canada by submitting an online form with basic details about yourself. Online survey community in Canada is rewarded with points, cards, shopping vouchers and cash. Volkswagen, Nike, Samsung, Amazon, Netflix, Disney and Starbucks are some of the world’s giant companies who come for their online surveys to Vindale Research. This company gives you an opportunity to earn as high as US$ 50 per Online survey. However, regular, daily online surveys from smaller companies and businesses are also available here. Pinecone Research is a trusted leader in voicing the opinions of consumers nationwide. Companies are seeking your input to develop new and improved products. By completing our online surveys, your opinions will directly influence tomorrow's products today, says the company website. Pinecone pays its online paid survey members in Canada with points that can be redeemed for shopping, and cash. OpinionPlus is a dynamic market research community built with its members in mind. OpinionPlus works with the world's leading brands to bring its members unique opportunities to voice their opinions and get paid cash rewards. OpinionPlus is a US-based online survey site . However, its surveys are available in Canada too. You can collect points for every completed survey. Upon reaching 1,000 points, the company pays out US$10 or its equivalent via PayPal. SurveyDownline is 100 percent free to join, says its corporate website. Further, you can opt out of your account anytime. “Participating in online surveys is an easy way to earn extra money in your spare time. Paid surveys are easy to fill in at any time of the day or night. Even the busiest of people can take a paid market research online survey in a few moments,” it exhorts. You get paid US$ 5 for simply joining in. iSurveyWorld offers online surveys which is paid in Canada. Again, you simply need to register online to participate in the online survey community for Canada. iSurveyWorld is one of the best websites you can enroll at to make extra money online. You can answer their surveys anywhere and at anytime. Permission Research is very active in Canada. This is an online survey and research community that helps companies to know more about their services and products. It also helps them gain valuable insights into how consumers perceive a particular product, service or brand. Permission Research pays rich rewards through points and cash. In recent months, Ipsos, a global leader has conducted several Online surveys on various issues related with Canada. This included what Canadians think about the social media and other relevant issues. A visit to Ipsos’ Canada website will reveal how deeply the company is associated with various subjects and consumer affairs relevant to you. MySurvey is part of Lightspeed, owned by WPP. MySurvey Canada has been taking the consumer’s opinion since 1932 as Canadian Facts, NFO & TNS. Company has already paid more than CAD 40 million to the worldwide members just in 2014. You can earn in MySurvey through online surveys, diaries & product testing. You can take online surveys from your laptop, desktop, tablet PC, mobile or Smartphone app. You can get paid by gift cards, e-certificates, vouchers, PayPal money. Participating in online surveys with Web Perspectives, you get opportunities to tell brands exactly what you think about their products and services. Web Perspectives also offers the opportunity to test new products and packaging and review advertising campaigns. “Every time you take one of our paid surveys you're driving real change to help companies know what they need to do to improve – and earning points for gift vouchers,” the company website says. For French speaking residents of Canada, the US-based paid survey giant offers the facility in this language too. However, this service is also open to French speaking people in the US too. For people well-versed in both these languages, Web Perspectives French offers extremely high returns. You can complete Online surveys in both languages, provided you have the time. 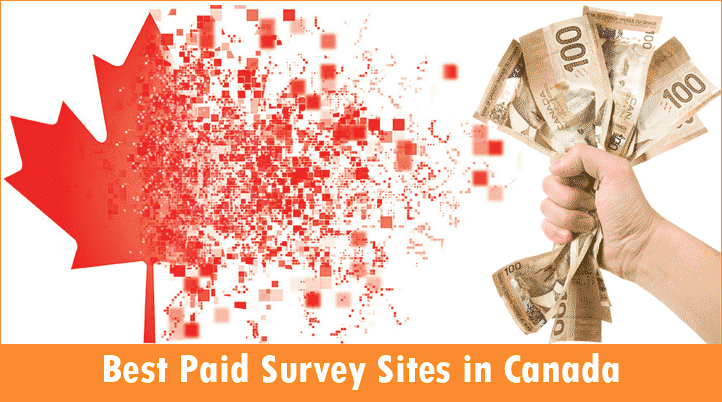 For Canada too, CashCrate offers scores of online paid surveys every week. Procedures to join CashCrate are very simple and similar to those on every other paid survey website. With CashCrate you have the option of completing several surveys on a single day. You receive points that can be converted to shopping vouchers and cash. You can select the topic of your survey and earn great money online. I’m from Philippines,I would like to know how to join on your website. IT IS GOOD AND NICE TO EARNED IN THIS FIELD. I aprishiyate to your this website and me join to your this website .